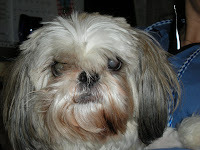 Over the recent Thanksgiving weekend, Isabelle --an eight-year-old Shih Tzu--suffered a severe attack by a group of dogs. When Isabelle arrived at Friendship she was alive but in shock and in very critical condition, the overnight doctor wasn’t sure she would make it through the night. She was minimally responsive, we could not register a blood pressure and she had gashes all over her body that thankfully didn’t penetrate her chest or abdomen. Her right ankle was dangling: a bite wound had severed the ligaments that hold it together and torn through the joint. 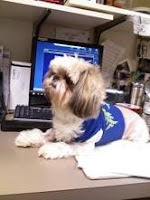 She was started on supportive care including blood pressure support, aggressive pain management and antibiotics. By morning she had survived and was looking better but this was just the beginning for Isabelle. 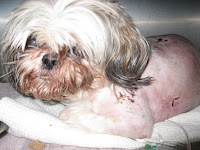 On Saturday, she was stable enough to have the extensive lacerations on her back cleaned under anesthesia and multiple drains were placed to help facilitate healing. Dr. Walker -- our board certified surgeon —saw Isabelle on the Tuesday after Thanksgiving. He repaired her ankle by fixing the joint in place with a plate, a technique called arthrodesis. The wounds on her back were left alone so we could see how the tissue would respond, this would determine how much was going to need to be removed in the future. Eight days after that horrible attack, Isabelle left the hospital for home--but would soon return. 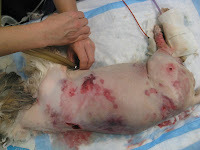 After two weeks, Isabelle’s wounds still had not healed and all the skin on her back and sides had detached from the underlying tissue. More drains were placed and the skin was tacked down to encourage adhesion to the body wall. She continued to come in daily for bandage changes so we could clean the wounds and assess their healing. Five weeks after her initial presentation, and six surgeries later, Isabelle’s last wound was closed. I am thrilled to report she is doing great. Isabelle’s story is inspiring; it highlights the amazing things that can happen at Friendship with a dedicated owner, committed doctors, caring technicians and one brave little dog. When Isabelle was at the hospital she probably spent 10% of her time in a cage. Most of the time she was in someone’s arms receiving the love she deserves or helping us work in the doctor’s office. Thank you to her owners for going the distance, and to everybody at Friendship for pulling for Isabelle and doing everything they could to make sure she made it home to her family.